Pattern & Size: Animal pattern is simple and classic, bringing in a breath of elegance for your bathroom. 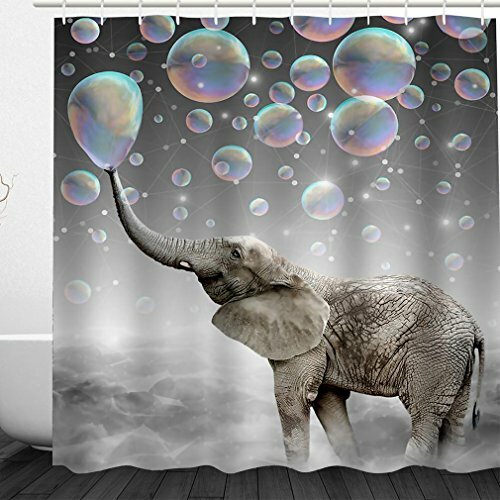 Shower curtain measures 72x78 inch. High Quality Polyester Fabric Material: Shower curtain is made of Polyester Fabric material, which is thick, durable, mildew resistant, waterproof and antibacterial. Reinforced Metal Grommets & Hooks: Reinforced metal grommets can protect the top eyelets from ripping and tearing. 12 Durable plastic hooks are included. Care Instruction & Satisfaction Guarantee: Wipe clean with a damp cloth. We recommend opening shower curtain to dry after each use. If you aren\'t happy, neither are we. Each curtain is backed by 90-day no-questions-asked money-back guarantee, 1 year warranty, and 24 hours customer service.